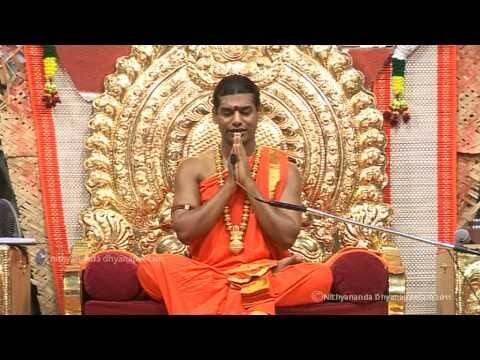 PARAMAHAMSA SRI NITHYANANDA on Aloneness leads to enlightenment How often do we succeed in that? Never. None of our questions can be answered fully from outside of us. All our questions have answers from within. Listen to the voice within. People often ask me this question: What is man’s eternal quest? I reply: Man’s eternal quest is to find himself. The person said: If I say that they will send me to an asylum! A small story: Jawaharlal Nehru, then the Prime Minister of India, went on a visit to a mental asylum. There he met an inmate who thought he was Nehru. When Nehru introduced himself as Nehru to this inmate, this guy came up close to him and whispered, “Don’t worry. That’s what I too said when I came here. If you stay here for six months they will cure you too!” Such is the nature of the world. Even if God himself comes and stands before them, in human form, or any other form, they will resist the idea. Even if God appears in front of you now, you will demand some kind of identification. “Show me your ration card or ID card” you will say. If I say that Self is superior, it is real, and our search should turn inwards, you will wonder, what is this man saying. Each one of us is unique. We are perfect as we express our true nature. In that state no one is brighter, much perfect, and more beautiful than any other. Try this simple exercise. When we are alone we try to relate mentally with others. Drop that. Do not blame others for our loneliness. Allow the loneliness happen to us without resistance. We will then feel alone even when people surround us. To start with, we need to experience physical loneliness. Once the joy of aloneness happens, it stays with us even when we are not physically alone. To have aloneness we need to do nothing; it’s our reality. For material comforts we need to work and struggle. To be alone you just need to let go. Aloneness leads to Enlightenment. A disciple asked a Zen Master: How long does it take to be enlightened? Master said: Just the time it takes to blink your eye. You are already enlightened. You only need to declare. Disciple asked again: What happened when you became enlightened? Master: Nothing! I decided to live in my enlightened state from that day. Blink and be in Bliss!